When folks in the real world get together and have a natter, you often hear something like 'If I had super-powers I would go to (insert war torn country here) and kill dictator (insert 6pm news promoted fiend here) before they can hurt anyone else.' With time travel easier to get in the DCU than decent mobile reception, Antheaus puts the question directly to Superman himself - would he kill Hitler to save thousands? Who's Antheaus you ask? He's the guy looking to carry out the idea and he's just joined the Justice League to do it. 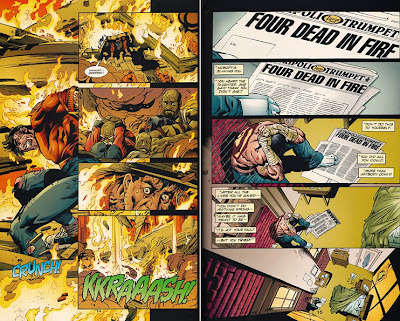 As the League stir the cerebral pot on what sort of person is best equipped to handle or wield power, Mark decides to fly solo to the war torn country of Kirai and end the atrocities he sees on the nightly news, by showing Superman the damages unfolding firsthand. Disappointed that Kal-El's 'intervention' in the war equates to Justice League delivered first aid and food parcels, Antheaus quits the team and heads out to dispose of President Mehtan himself. 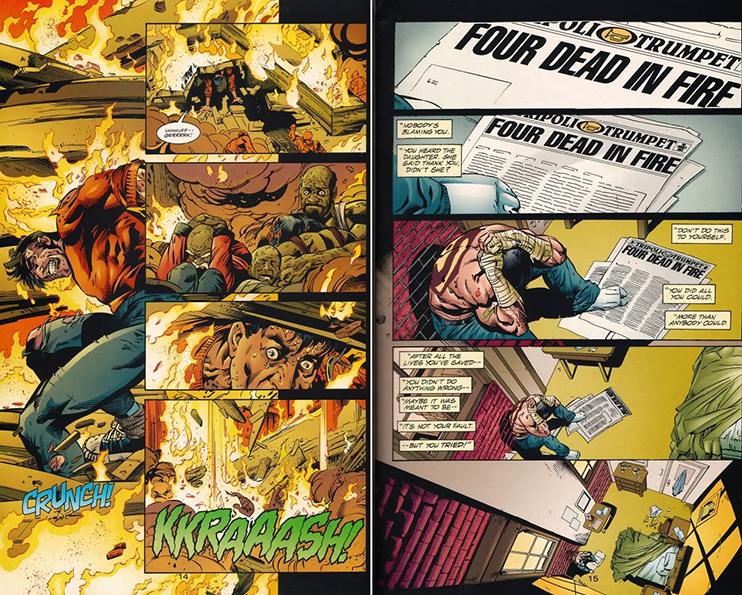 Drawn by the dramatic and adrenaline fuelled pencils of artist Scott Eaton, Mark's divergence from the ideals of his former teammates turns physical as the two perspectives literally collide. Expanding on the question at the start of this article, the post-throwdown effects will show all no stone splashes in a pond without causing it's share of ripples. Ripple neither the League or Mark will be prepared for. 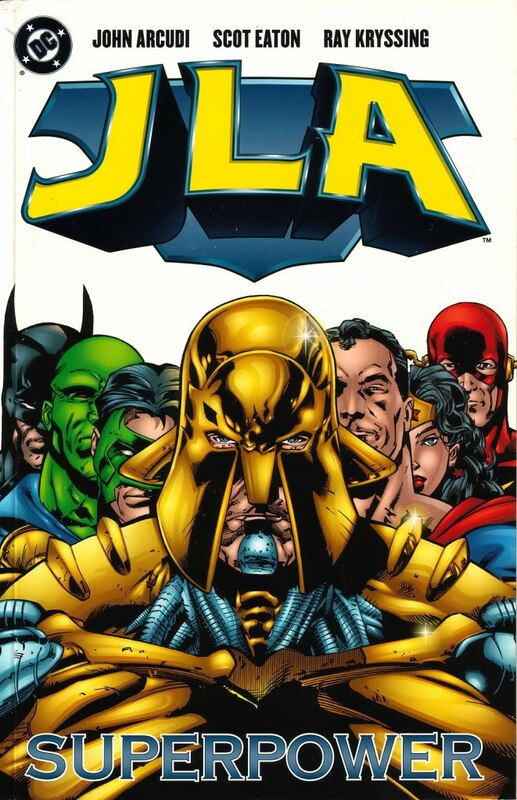 While ambassadors of state Wonder Woman and Aquaman don't quite get the relative showtime you'd think they would in a tale of this nature, JLA: Superpower pokes your cerebral grey matter with all the force of a nail-gun. 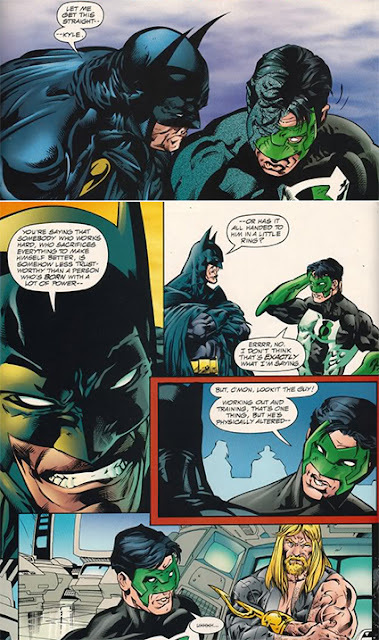 Superman, Batman, Kyle and Mark, you'll see things from each of their perspectives before the last page is turned and you are led into the pull-no punches conclusion. In fact Superman's parting words with Kyle will have you not only reevaluating the JLA-worthiness of the cosmic twenty-something himself, but also of every hero who has ever joined their ranks - including those of the current roster. Good choice for topic Dan. Issues like this are needed more than often to keep even us fanboys on our toys, as far as morality and how it relates to having super-powers. 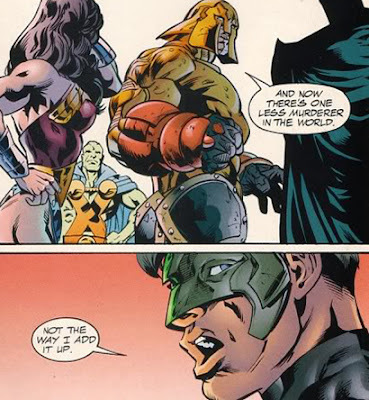 I also recommend the Kid Amazo arc from JLA:Classified, another arc there has the JLA(mostly) try and do the same thing here but w/o killing the dictator or using their powers, and the mark waid/bryan hitch JLA story, Heaven's Ladder that involves religion and how each one of the then JLA have their own views on spirituality and God. Thanks Dale! Heaven's Ladder will probably get its own post before long, that book is amazing. Bryan on the League was a dream come true, and his Aquaman was one of the only versions that made the silver shoulder version of the character shine. Like you say what is great about books like Superpower is that you don't need a great foe to make a sweet story, sometimes the difference of perspective within the teams ranks can do the job on its own! Exactly. Of course it's also incredibly important not to force a specific pov or belief down readers' throats when dealing with topics like this. Just show the story, present the facts, and let the readers stew and think about it. Oh, and hell yeah, Hitch(along with Howard Porter) really did sell the hell out of that funky shoulder armor outfit.